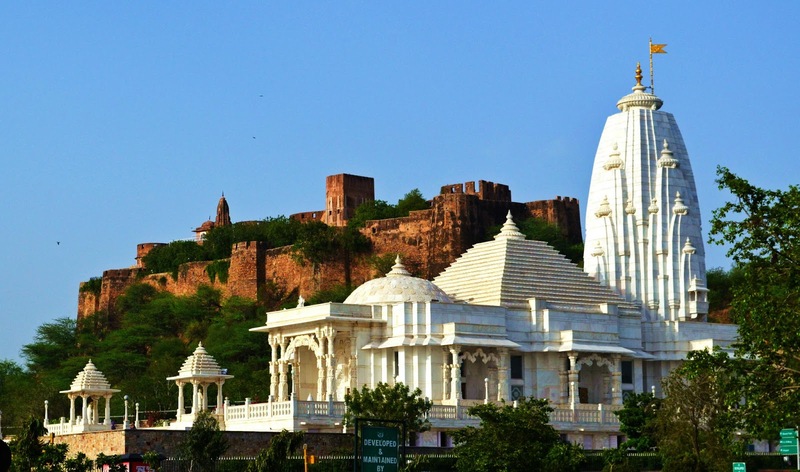 Today we are presenting an article on "Important Temples of India”. 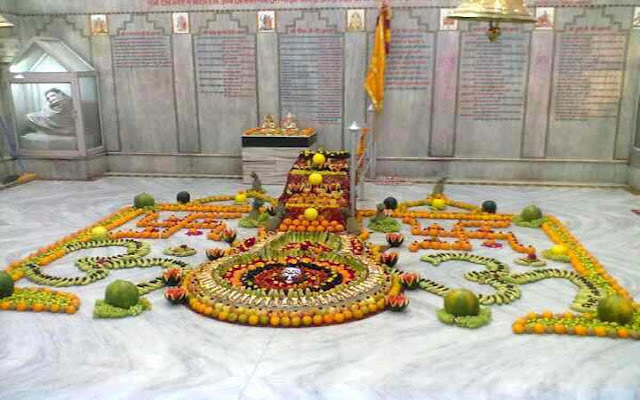 Must read this article to know about the significance & importance of the temples in India. 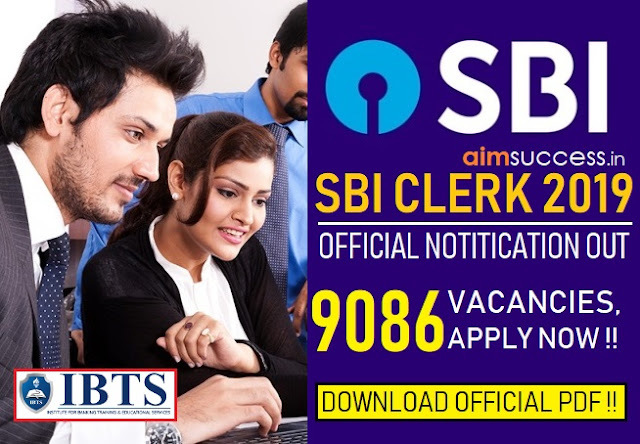 This article will help in your preparation for General Awareness section for upcoming exams like ssc exams. Temple which is called “Mandira” in Sanskrit is a house of workship. Temples in India reflect the cultural glory and history of a place. In India, temple is considered as a place where human spiritually connect with God. Temples are built on the principles of vastushastra, known as “Shilpa Shashtra”. It is a symbolic, miniature representation of the cosmos. Famous For- The temple is famous for lord Shiva’s Linga which is in the cave. The cave is situated at an altitude of 3,888 m (12,756ft), about 141 km from Srinagar and one can reach through Pahalgam Town. The cave is covered with snow whole year except for a short period of time in summer when it is open for pilgrims. The cave waxes during May to August, as snow melts in the Himalayan above the cave and the resultant water seeps into the rocks that form the caves. It is also claimed that the Shiva Linga grows and shrinks with the phases of moon, although there is no scientific evidence for this belief. It is also claimed this is the cave where shiva explained the secrecy of life and eternity to his divine consort, Parvati. Two other ice formation’s also represent Load Ganesha. 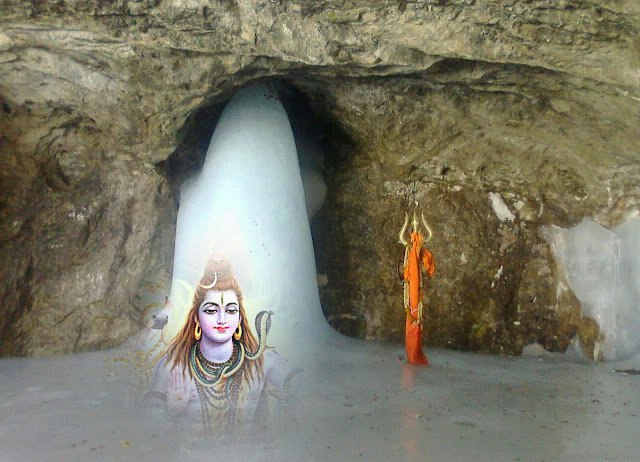 There is a annual pilgrimage for this cave to workship the ice stalagmite Lingam. Yatra- The beginning of the annual pilgrimage, called Amarnath Yatra is marked by ‘pratham pujan’ to invoke the blessings of Shir Amarnathji. It is a popular yatra destination for Hindus. Pilgrims visit the holy place during the 45 days season around the festival of Shravani Mela in July- August. 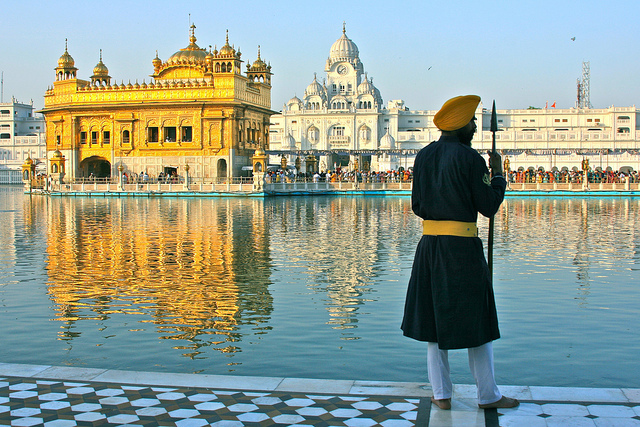 Founded in 1574 by the fourth Sikh Guru, Guru Ram Das, the fifth Guru, Guru Arjan designed the Harmandir Sahib to be built in the center of this holy tank. Famous For- The gurudwara is surrounded by the large lake and it is believed that it consists Amrit and is fed by the Ravi River and by this name Amrit the city named “Amritsar”. There are four entrances to the gurudwara which signifies the importance of acceptance and openness of all the religions regardless of their colour, creed or gender. Maharaja Ranjit Singh was a major donor of wealth and materials for the shrine and he is the person who platted the Temple with Gold in 1830, hence it is called “Golden Temple”. While visiting the temple, the devotees are requested to dress well in the temple, wearing head covering which is a sign of respect to the lord, Not wearing shoes. One should sit on the ground while in the Darbar Sahib as a sign of deference to both the Guru Granth Sahib and God. 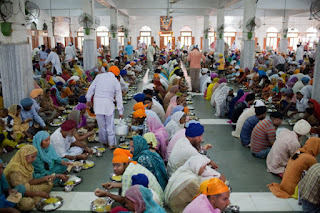 Langar- It is called Guru ka langar. 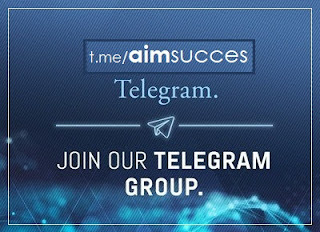 It has ensured participation of women and childrens in task of service for mankind. Women plays an important role in the preparation of meals and children help in serving food to the devotees. It is very generous, that everyone is welcomed in the Langar. Each family prepare food for a week and feed thousands of people daily. All the preparation, the cooking and the washing up is done by the helpers in the temple. The langar is free of cost for all, the temple get fund from the deposit from pilgrims. Famous for—The temple is said to be at the place where Markendeya worshiped at the time of his destined death at the tender age of 16 years. He wished to win over Lord Yama, the God of death and change his destiny. When Yama came to take his life, he clung to Shiva Linga and the noose fell over the Lingam. Lord Shiva appeared and pierced Yama with a trident and saved his devotee. And Shiva blessed Markandeya to live immortal life as Chiranjeev. The temple is made of marble and has an exterior arch welcoming pilgrims. It has a Shiva Linga with Lord Shiva’s idol and young Markandeya in a prayerful posture. The walls of the temple depict a scene of Lord Shiva saving the child Markandeya from Yama, the Lord of death. 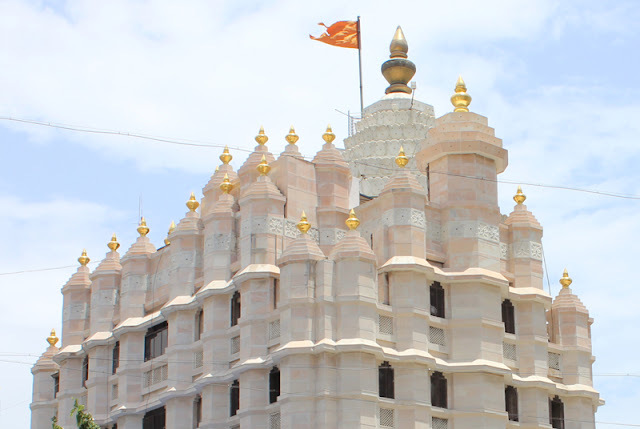 Pilgrims visit the temple in large numbers in the month of Shravan (July/August). 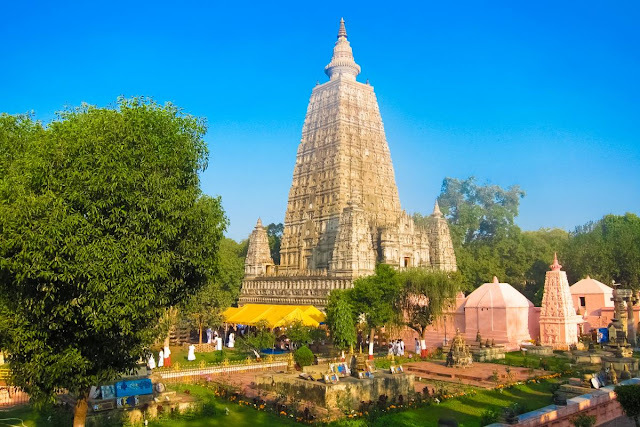 Famous For- Mahabodhi Temple is a Buddhist Stupa located at bodhgaya, 116km from Capital of Bihar, Patna. The temple is built in bricks and which is still survives today. The ground level of the temple is 45 meters square, stretching up in a pyramid shape that ends in a smaller square platform. The central tower of Mahabodhi stands 180 feet (54 meters) tall. The brickwork on the outside of the temple depicts scenes from the life of the Buddha. Inside the temple is a colossal image of a seated Buddha touching the earth with his right hand (a gesture known as the earth-witness mudra). In this posture the Buddha accomplished the supreme enlightenment. The statue is of black stone but it has been covered in gold and dressed in bright orange robes. The temple covers an area of nearly 4.8 hectares and 55 m in height. Bodhi Tree- Immediately next to the Mahabodhi Temple is the Bodhi Tree, a descendent of the very tree under which the Buddha was enlightened, and the Jewel Walk, marking the place where the Buddha is said to have practiced walking meditation for seven days after his enlightenment. Built in – Year 1988, by Birla Group of Industries. Famous for- Originally it is known as Lakshmi Narayan Temple and it is situated below the Moti Dungri Fort in Jaipur. It is dedicated to Lord Vishnu and Goddess Lakshmi. Built in pure white marble, it is built with modern approach. Inside the temple, Lord Vishnu and Goddess Lakshmi idols can be seen. Temple represent architectural beauty as its delicate carving of Hindu symbols and ancient quotes from the Geeta and Upanishads ornaments the walls of the temple. Apart from religious idols, pictures and figures of several religious saints, philosophers and historical achievers, like Socrates, Buddha, Zarathustra and Confucius, are also included in the temple. The best time to visit this temple is between the months of October to March. In this temple, 'Janmashtami', the birth anniversary of Lord Krishna, is celebrated with great enthusiasm. Famous For- Meaning of Somnath is the protector of God Moon. Somnath Temple is also known as Prabhas Patan, Deo Pattan or Somnath temple and the Shrine Eternal. It is one of the 12 jyotirlinga Shrines of God Shiva. It is believed that the temple is built by King Somraj, the moon god out of gold. It was rebuilt by Ravana in silver. Again Lord Krishna built in wood. The apex of temple rises to a height of 155 feet. There is a kalash (pot vessel) on the top, which measures 10 tons. The flag mast on this pinnacle is 37 feet long and is changed thrice during the day. 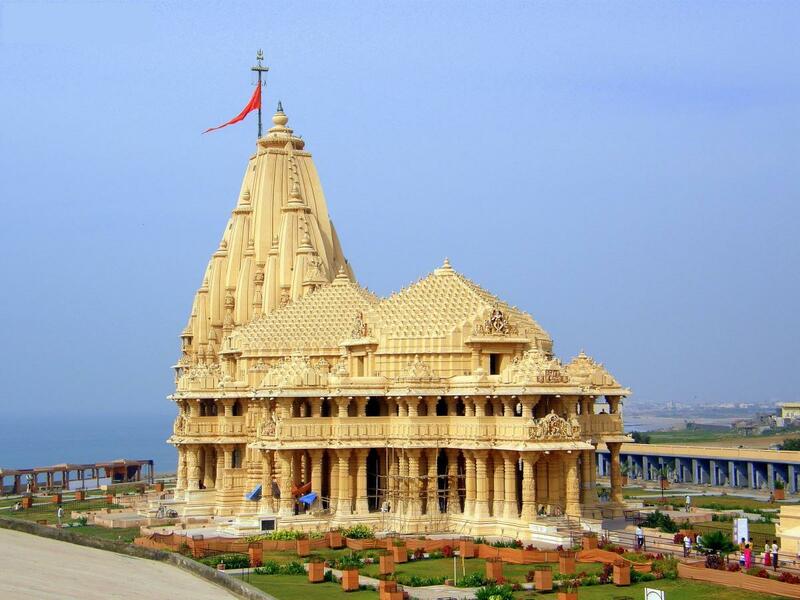 The temple is situated at very extraordinary place there is no land in between Somnath Seashore to Antartica. Somnath Temple was destroyed many times by various rulers and kings. But few kings of Gujarat renovated this temple too many times. In 1947 Sardar vallabhbhai Patel renovated Somnath Temple. Somnath is famous for its architechture, the present temple, kailash Mahameru Prasada is built in the chalukya style of temple architecture and reflects the inherent skill of Sompuras,Gujarat’s master masons. Famous For- Late Deubai Patil who was a rich lady of Agri Samaj from Matunga. Although she was rich but had no child. So she humbly request lord ganesha “Although I cannot have a child, let other ladies who are childless get the pleasure of child on visiting the temple and praying you”. Looking at the successful subsequent history of the temple, it appears like Ganesha nodded. Therefore, it is famous for “Navasacha Ganapati” in Marathi. The idol of Shree Shidhivinayak was carved out of a single black stone and 2’6 (750mm) and 2’ (600mm) wide with the trunk on the right. This is rather unusal appearance of Lord Ganesha. The upper right and left hands hold a lotus and an axe respectively, while the lower right and left hands hold a rosary (japmala) and bowl full of “Modak” respectively. On both sides of the Lord Ganesha Idol, idols of Riddhi and Siddhi goddesses who are appearing like peeping out from Ganesha Idol from behind. Note: We will provide IInd part of Important Temples of India soon.